Search engine optimization (SEO) is complicated. Google and the other search platforms continue to enhance their search products by adding ranking factors and refining existing ranking factors on a regular basis. In fact, Google announced an average of 6 major algorithm updates per year from 2016-2018. With the rate at which things change, it’s easy to get caught off-guard and not update your content strategy based on the latest SEO best practices. No worries, with a little assistance and an easy to follow scoresheet, you can improve your current on-site SEO. Additionally, our team will update this scoresheet as the aforementioned best practices change, so you can stay on top of your On-Site SEO. The overall goal of this scoresheet is to give you a guide to some of the most important elements of On-Site SEO. Each of the sections contain criteria considered to be the most important elements of on-site SEO. The last columns of the scoresheet provide a fillable space for you to score your content out of the total score possible. Line-by-line, refer to your content and fill out the scoresheet. There is no partial credit for the individual criteria. You either score all eligible points or a zero. The scoresheet will auto-generate your total score at the bottom. Your end goal with this scoresheet is to get all the way to 100. You are doing pretty well if you score 90 and up. Anything below 80 needs work. Successfully scoring high on the scoresheet is based on making sure your article or post is aimed at your targeted keyword phrase. It’s in all prominent elements of the content, including the title, description, in the first paragraph, etc. The most important portion of text on a webpage is the header text, which in our scoresheet we refer to as “TITLE”. It should define what that specific page is all about—for both search engine bots (structurally through the code) and visitors (CSS design should make it the largest and most prominent). That’s why we’ve assigned the highest value of 20 points for ensuring the header/title of the page has your targeted keyphrase. In the example below from a previous post, our keyphrase is "Convert social media engagement into sales." It's in the title and clearly defines what the post is about. Following the Title, the next important piece to focus on is your meta description. What is meta description in SEO? It’s also important that the meta description and the first paragraph includes your targeted keyphrase. 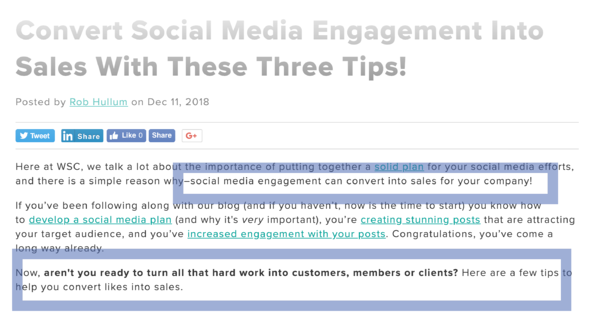 In our example post, we've highlighted how we've included our keyphrase in the the first paragraphs without sounding robotic. 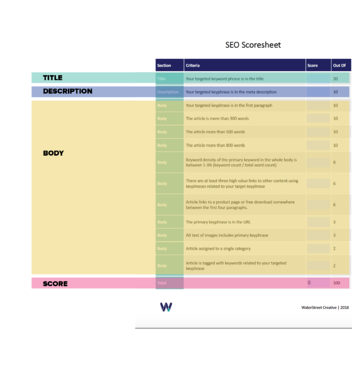 Our scoresheet sets the ideal length for content at around 800 words. That should take an average reader about 5 or 6 minutes to read. Few articles under 300 words, other than a page of links to other resources like a tag page rank well in search results. Think of it this way: It’s difficult to answer just about any question in 300 words. 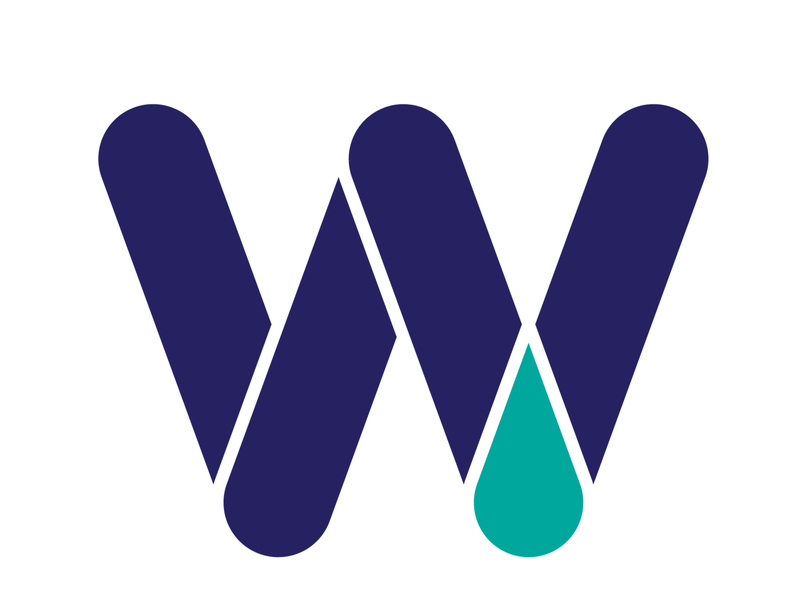 Whereas you can present truly valuable information in 500 words, especially if the post has links to other relevant content. Keyword density sounds like a complicated concept, but it’s pretty simple. 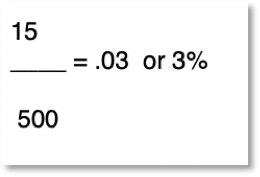 You calculate it by dividing the number of times your targeted keyword is in the article by the total word count. GOAL: Target a keyword density of between 1-3%. You can use the “Search in Document” (if you use Microsoft Word) to identify how many times your keyphrase is included. And Word has a handy Status Bar at the bottom that shows total word count or will display the word count of selected text. For example, if you have written a 500-word article, you would have included your keyphrase somewhere between 5-15 times. If you are under 1%, the search engines might not be able to figure out that your keyphrase really is a keyphrase. If you are over 3%, your writing starts to sound less human. From the example above, the end of the post has a CTA. 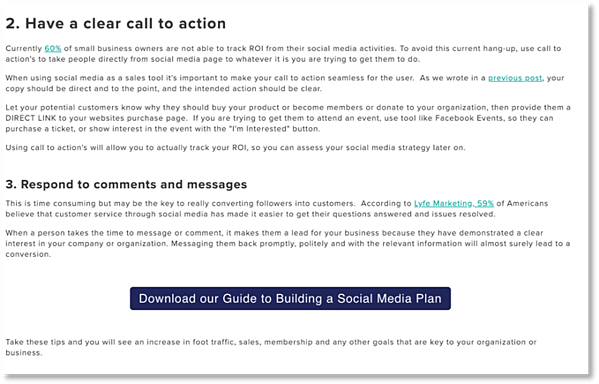 "Download our Guide to Building a Social Media Plan" that clearly and boldly leads the reader into next steps. If you already have quality content in your content archive that you feel should rank well, sometimes reworking the title, refreshing the article to make sure it’s current and updating the post date is all you need to do to get a big boost. And you can share the refreshed article again on your social and email marketing channels! Have questions about the scoresheet? Leave them in the comments. We promise to reply to every comment.